Ever Wonder Who Is Supposed To Maintain Our Sidewalks? Though it may be our ardent fantasy that the city of New Orleans should be responsible for the repair of our sidewalks, please read below you get into an argument at city hall. 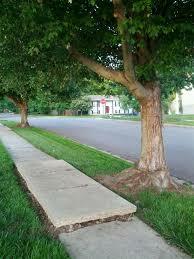 However, the Recovery Roads Program does include some funding for repairs of sidewalks damaged by Hurricane Katrina. To see if the sidewalk in front of your property has been deemed eligible for repair by FEMA, visit the Recovery Roads website . To ensure your new sidewalk will be built to the proper standard, click here for the Guidelines for Sidewalk Construction . If your sidewalk is in the French Quarter/Vieux Carre click here for Guidelines for Sidewalk Construction in the Vieux Carre.